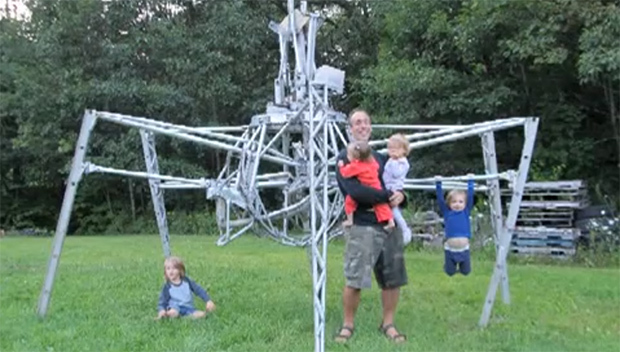 Since 2007, [Jamie Mantzel] has been building a huge remote-controlled walking robot. If you’ve been following him on his YouTube channel and blog, you’ve seen the very beginnings of him building a lumber mill to create a workshop, making the legs for his robot, and improving his welding rig. This week, though, has been very special. [Jamie] has finally finished his giant robot project, bidding closed the fevered dream of a madman who awakes to a 10 foot robot in his yard. The giant robot is constructed nearly entirely out of scrap aluminum. In the interest of simplicity, [Jamie] has come up with some interesting techniques to scale up conventional RC gear to power huge motors swinging giant legs: the steering motors are powered by manual switches, but these switches are activated by servos. A brilliantly simple solution to driving high-current loads if we do say so ourselves. [Jamie]’s robot has garnered a lot of attention over the years, so much so that toy companies have licensed his designs for a line of battling combat spiderbots. [Jamie] believes his robots should be more educational, so he’s launched a Kickstarter for his own version as a kit. With this kit, getting the bug tank robot up and running isn’t simply a matter of pulling it out of the box and installing batteries; [Jamie]’s version is an actual kit with linkages that must be assembled. We know which version we’d want. It’s an amazingly impressive project, and we’re glad to see such an awesome cat has finally realized his dream of a walking aluminum arachnid of death. I have been following his you tube videos from time to time, and have so far been worth the time. Can’t wait too see what he does next. Am I the only one thinking that Spell check still is not the same as a human reading these articles? Only 6 days left on his kickstarter, and a bit to go in funding… so don’t be shy, get on over and make a pledge! Aaah Jamie! I looked at all of his videos in two days! I’m almost positive this guy is insane…but in the best possible way. Having watched his youtube videos this guy reminds me to Crazy Eddie from the First Wave TV series. He put a *huge* amount of work to make that robot but saddly not in the most efficient way and not only in the technical aspect. Efficiency in the build has been the least of his concern. Not like he has been working on it full-time and the process has taught him a ton of new skills which arguably is more valuable than the end result. Really cool to finally see it make its first steps and turns though. Now to see if that kickstarter makes it! I like how the one kid is using it as Monkey Bars !!! I’m really pretty sure that Jamie is a low-end superhuman. I see him do too much without injuries, when I know he should be getting cut up or drop things on himself. Its awesome to see Jaimie’s robot walking at last, we’ve been working with him for a few years now and its been a great experience! Or you could use one of those new-fangled “relay” things… surely? Damn, A six year project that is WELL worth a Hack-A-Day post and they don’t even get the dudes F-ing name right. I give up. Wow Hack-a-Day. You report on an epic 6 year long build about someone many people follow, and can’t even spell his name right? I give up. I cried watching this video, I believe I was actually turned onto his channel by this website many years ago before he even had kids, Been one of my favorite subscriptions since I found youtube. So happy to see him successful.